Despite Tim Cook's most valiant efforts to get you to believe that the only laptop you'll need in the future is the iPad Pro with its optional folio keyboard accessory, Apple partner Adobe thinks that creatives will want to carry more than just a tablet to complete their projects. We had a chance to sit down and chat with David Macy, Director of Mobile Product Marketing, Creative Cloud at Adobe, to talk about the iPad Pro, Microsoft's Surface Pro 4 and Adobe's app strategy with Apple's biggest tablet to date. Some of Macy's answers will surprise you, but Adobe is bullish on the mobile market, claiming that mobile devices will drive "the greatest revolution in the creative process since desktop publishing in the 1980s". During a launch interview with UK publication The Telegraph, Apple CEO Tim Cook hyped the company's large-format tablet as a productivity powerhouse, saying it's a suitable laptop alternative for many users. "I think if you're looking at a PC, why would you buy a PC anymore? No really, why would you buy one?" said Cook. "Yes, the iPad Pro is a replacement for a notebook or a desktop for many, many people. They will start using it and conclude they no longer need to use anything else, other than their phones." Cook noted that he travels with just his iPhone and his iPad Pro, opting to leave his MacBook at home. While the iPad Pro can be a great system for productivity for many users, Adobe's Macy thinks creative professionals may still need to rely on a powerful desktop at work. "You can do a tremendous amount of design and concepting work on the iPad Pro by itself, but I don't think that most people are ready to move their entire production workflow to the iPad," Macy said. "And that's why integration with the desktop is very, very important." In an example, Macy said he may be working on a layout for a website, where he can use the iPad Pro for retouch imagery and typography. "But most likely, at some point, I am going to hand the layout to somebody else on the team who is going to put it into a larger architecture for the overall website, or I am going to hand this off to a developer who is going to start coding it. And that's where the connection to the desktop is going to come in." When asked directly about Cook's comments and if the iPad Pro can effectively replace a Mac or PC for creatives, Macy said, "I think that it will be possible for a large portion of many people's workflows, but not for everybody and not all the time. I don't think that's because of limitations in the device itself, but because of the way people work. And sometimes, it takes time to change." Macy compared the iPad Pro to when smartphones initially launched. Some people could do everything on their smartphones, but others still had to use a desktop to accomplish some tasks. "We'll see the same progression over the next couple years as all kinds of companies and industries look at tablet devices as an important tool to support." Surprisingly, it's not just the iPad Pro that requires a desktop companion as part of a project workflow. Even as the competing Microsoft Surface Pro 4 is capable of running the full version of Photoshop and Adobe's Creative Cloud, creative professionals are still going to have to rely on a desktop at some point during their workflow. "The same thing is going to happen with the Surface Pro," Macy said. "The difference here is with collaborating with other people, not necessarily about the difference in the OS" that will drive projects back to the desktop. Macy said that a lot of Adobe's customers are now using on average at least three devices each, two of which are desktops or laptops, one at work and one at home. The third device is a smartphone, Macy said, and that could be either an iPhone or an Android. "We're starting to see more pickup of people using tablets, like the iPad, and that's where the iPad Pro comes in," Macy said. "With previous iPad models, a lot of creative people thought they were going to use them as tools for creativity, but they didn't have the functionality they needed." 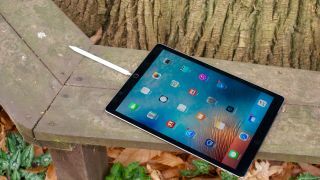 Some of the features lacking on older iPad releases include small displays, low resolution screens, lack of performance and apps that are not capable enough. The biggest key, however, in the early failure of early tablets for creatives, is the lack of a well-built, integrated stylus, according to Macy.